Dissolve yeast in water with 1 T. sugar in large bowl (water should be hot, but not boiling). Mix egg, oil, rest of sugar, salt in small bowl. Pour mixture into large bowl after yeast foams (about 5 min.). Add flour a little at a time and stir to take out lumps. After you add about three or four cups of flour, the mixture will become too thick to stir. Wash your hands, and knead the dough by pressing down on it with your palms, adding more flour until you can make the dough into a large ball which isn’t sticky. Keep the dough ball in the large bowl. Cover the bowl with a hot moist towel (put it under hot water, then wring it out before covering the bowl). Allow dough to rise at room temperature for about one hour. Remove towel and divide the dough into smaller balls (3 balls per hallah). Roll each ball gently until it looks like a snake. Braid each group of three snakes on a baking pan. 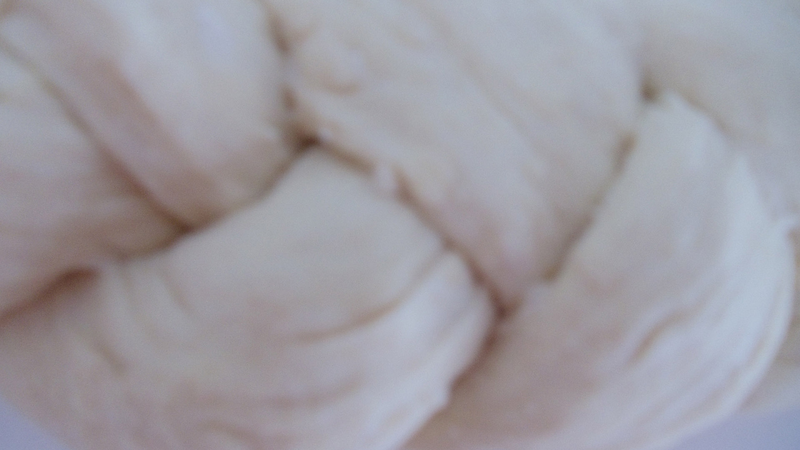 After they are all braided, cover them loosely with a reheated towel.